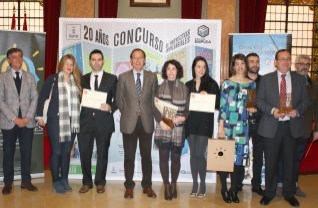 World Choice Education was announced the winner of the “XXII Concurso de Proyectos Empresariales” in February in Murcia (Spain). We ´t believe it but it was true! We actually won the first prize! Our project, World Choice Education Murcia, was chosen as the winner out of 47 other projects. See further information and press news here. This was just the beginning, winning the prize wasn´t the most difficult part, now we had to make it all a reality! Our business plan consisted of opening a new office in Murcia (Spain) were we could export our “Free agency services model” to Spain. Our aim was being closer to our beloved Spanish students to give them a better face to face support and offer the chance to get to know us in person. On the other hand, our idea was to start helping other international students to come to Spain and learn Spanish while enjoying sunny Murcia. We are a young team led by a young entrepreneur, Noelia Rodriguez, who was born in Murcia (Spain). Few years ago, Noelia decided to change her life and go to live abroad and she ended up in Bournemouth. Mainly she was forced by the need of learning English progress her professional career. It wasn’t easy for her (nor is it for the rest of foreign students who decide to live abroad), as many of them, she started from scratch, working in the hospitality industry as a kitchen porter and collaborating on a voluntary basis with an educational agency. One day, she had an idea, and she suggested it to her manager however, the answer that she received was “You are here to work, not to think”. As you can imagine, this was not easy for her to digest but she decided that “she was here to think” and to “think big”, so after a lot of courage and determination, she decided to go after her dreams. She rented a desk in a co-working space, and started working hard. After 3 years of non-stop working hours, she has built a successful and well-known educational agency based in Bournemouth (UK) where she runs a team of 5 people: Beatriz García, Raúl Benito, Monica Barreto, Vanessa Marín and Daniel Davis. 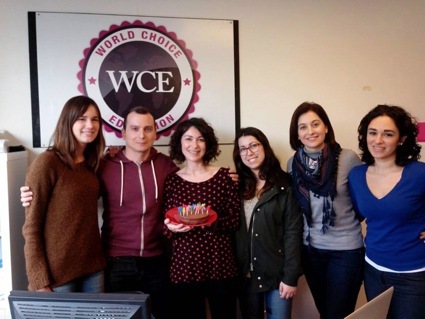 Thanks to Murcia´s recognition and the prize, from last week, we can now also say that World Choice Education has an office in Spain, where so far there is only one person working, Isabel Navarro but we are looking to expand the team! Last week we were able to see how our dreams can come true. The doors of World Choice Education Murcia finally opened for the Spanish market. It was a very exciting and emotional moment for all of us. We organised a breakfast with partners, press, collaborators and of course family and friends who have always been there to support us. We are really proud and very enthusiastic with all that is happening at World Choice Education, and we wanted to make you part of all of this. If you are near Bournemouth or Murcia, please do come and see us! We would be happy to see you!!! By worldchoiceeducation in Uncategorized on May 1, 2015 . Enhorabuena por la inauguración de la oficina de Murcia. OS deseo grandes éxitos y que además lo paseis bien. Muchas gracias Ángel! Esperamos que vengáis pronto a visitarnos! Ohh Andras!! All the best for you too!